Winged Beasts are the new monster type creatures in Yu-Gi-Oh! BAM and they are known with their First Strike effects. Along with the new cards released after the Winged Beast batch, some new cards can further enhance the Power of Winged Beasts! 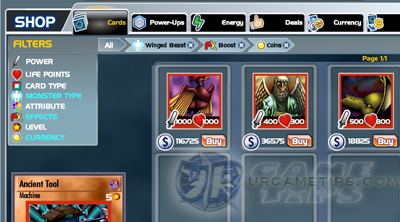 Refer below to learn how to create your very first Winged Beast Boost All deck! - All your Winged Beast monsters gain power. the battle phase! This will give your monsters a huge advantage when done right. for each Winged Beast monster card. Compared to other decks, this is already acceptable, considering that these are just "Coin Cards". 2000+ Power in 1 turn! Use your Immune Spells to protect them and boost them more. - Use your Spells to support your monster's Power growth while in duel. - Place Spirit of the Books card at the left most channel to destroy spells. - Boost All effect will trigger at Round start, so it doesn't matter where you place them. - Place Mirror Force at the left most channel for better performance. doesn't have any Requiem, Immune or Cripple All effects. - If you have a good amount of Immune spell cards, you can place these as your main card.